20% Off Red, White & Blue Fabrics! Patriotic Fabrics & Patriotic Patterns! 25% off for our Barefoot Club Members! Row by Row 2016 is off to a fantastic start! Festivities kicked of n June 21st and we've already sold our first batch of kits and are into the second! The message boards are saying our row is a "must have!" Have you gotten yours yet? This gorgeous new line is fresh as a summer breeze with its trellises and florals in soft greens, white, shaded pinks and corals. Perfect for sitting on the porch with a Mint Julip in hand! 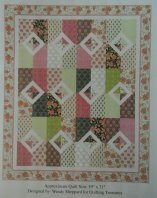 Kits are now available to make this lovely 59" x 71" quilt!